This entry was posted on February 4, 2019 by piranha. As we trudge through the depths of winter, making plans for a brighter, breezier and fruitful spring, savvy restaurant owners, pub landlords, hoteliers and event planners will already be looking forward to getting their customers outside to enjoy some al fresco dining in the fresh spring air. It’s all the rage! When the weather’s good, there can be few things better than dining al fresco. From the Ritz Restaurant Terrace where Paris comes to London, this hidden gem with lush green gardens and high walls brings a taste of Parisian living to this quintessentially British hotel, to the Scarlet in North Cornwall, built to the highest eco-standards, where the restaurant perches on the cliff-top overlooking the golden sands of Mawgan Porth. More people will come to your venue if you offer an outdoor seated area. Diners love to eat outside as it appeals to the senses and has the effect of making food seem tastier and fresher. When the weather is good, you can open up a whole new alternative space and with that can come more bums on seats and more money. Eating outside encourages a fun atmosphere and often more drinks, including wine, beer and cocktails, are consumed. This again is better for your bottom line. 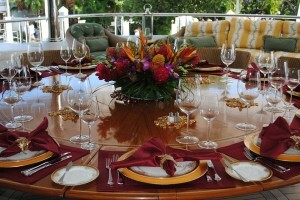 Because the outdoors is the attraction, you don’t have to spend as much on your décor and table decorations. It’s no surprise that the biggest barrier to offering al fresco dining in the UK is the great British weather. When it’s pouring down outside, you are, of course, losing money! Additional seating, used seasonally, can also cause additional demand on resources such as toilets and, like the weather, it can also be tricky to forecast how many staff will be needed for additional covers. Outside areas are perfect from creating a little diversion from the main menu. Why not have a barbecue? Cinders offers a range of barbecues and accessories that are powerful and dependable to help you create the perfect al fresco dining experience.